The “land of fire and ice” is a place of many wonders, including the rare opportunity to see the spectacular aurora borealis – or northern lights. Travel in Iceland will bring you on a search for that once-in-a-lifetime moment. Take an exhilarating evening northern lights cruise. Travel to the “Golden Circle,” home to many of Iceland’s most renowned natural wonders. Spend time at Thingvellir National Park, the nation’s most historic area. 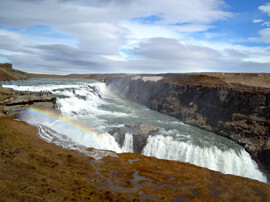 Gaze at the spectacular Gullfoss Waterfall – one of the world’s most incredible cascades. At Eyjafjallajökull Volcano Visitor Center, learn about life during and after the dramatic 2010 volcanic explosion. 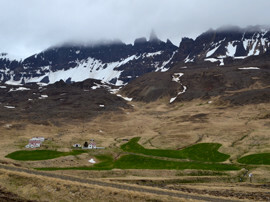 Explore Skogar Folk Museum and see traditional turf-built homes. Walk on a black volcanic sand beach. See Jökulsárlón glacial lagoon filled with floating icebergs. Relax in the warm, mineral-rich water of the natural geothermal pool the Blue Lagoon. Spend your evenings gazing at the night sky in search of the elusive and dazzling northern lights. Join together with Jewish singles from North America as Iceland truly comes to life on this spectacular Amazing Journey. Each year, travelers journey to Iceland and venture out into the dark to see the magical but elusive northern lights. This natural phenomenon is the product of collisions between electrically charged particles from the sun that enter the earth’s atmosphere; the results are spectacular! Streaks of colorful light appear across the sky. The colors can vary from white to pink or purple and, most commonly, green. It is known that the best time to witness the lights in Iceland is from late September to mid-April, when the nights are the longest. This light show is truly dazzling and worth the pursuit. Click here to watch the preview video of Iceland’s Magical Northern Lights! A deposit of $350 is due with your reservation. Full payment is due August 8, 2018. Cancellation Policy: From the time of initial deposit until April 16, 2018, there is a $75 per person penalty for cancellation. From April 17 – August 7, 2018, the cancellation penalty is $350. From August 8 – September 17, 2018, the cancellation penalty is 50%. Cancellations made on or after September 18, 2018 and “no-shows” will receive no refund. There is no refund in the event of interruption or cancellation after the start of the journey. Flights and Transfers: Airfare is not included with the tour cost. Roundtrip airport transfers have not been included in the tour rates. More details will be provided several weeks prior to your departure. It is important that you not purchase airfare until you receive a confirmation letter from Amazing Journeys which will contain specific flight parameters. Taxes and Gratuities: All taxes, service charges and government fees have been included in the rate. Taxes, service charges and government fees are subject to change. All gratuities have been included for the tour guide, driver, hotel staff, baggage handlers and meals that are included on the itinerary. Passport Requirements: A Passport is necessary to travel on this itinerary. It must be valid for six months beyond the last day of the trip. One blank page must be available in your passport. 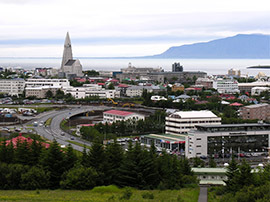 At this time, no visas are necessary to enter Iceland for those from the US, Canada or UK. If you are a citizen of another country, please check the website for the Icelandic Directorate of Immigration to see if a visa is necessary.